Live from New York, it&apos;s Donny and Marie! Stage • Utah siblings work the room at the opening of their first Broadway show. New York • Donny and Marie Osmond stood at the top of wholesome, family-oriented entertainment 35 years ago, back when they were teenagers and Times Square was full of X-rated movie houses and adult book stores. The duo from Utah's famous first family of singers were chided for their uncompromising approach to old-style entertainment during the 1980s. That was the era when Times Square began its gradual transformation into a center of pulsing lights, shops and attractions that makes visitors feel as if they are inside a video game. 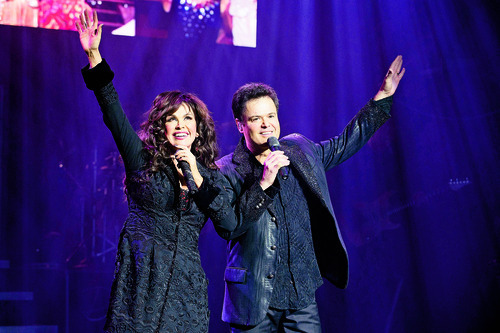 True fans might say the timing couldn't be better for a Donny and Marie show on Broadway. Ticketholders to Dec. 9's opening show sounded more interested in extending old memories into the future than making side-by-side comparisons. "We still have our ticket stubs from Madison Square Garden when Donny and Marie played all those years ago," said Donna Bodiglio, a courts worker from Union City, N.J., waiting for a peek at Donny after the brother-sister act's first-ever Broadway performance together. "It was less money then, but it's worth it even now. It brought back memories of being 12 years old and watching them on TV." "Donny & Marie: A Broadway Christmas" sold out both its opening and second weeks at Marriott's Marquis Theatre on 1535 Broadway at 46th Street, with tickets starting at a reasonable $51.50 and soaring to $251.50. 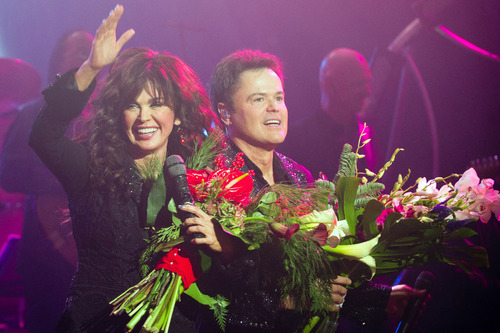 It also marks a step forward for the Salt Lake-based promoter NewSpace Entertainment, which with Magic Arts & Entertainment is producing the Osmonds' show. The show cost an estimated $3 million, according to Steve Boulay, NewSpace Entertainment chief operating officer. 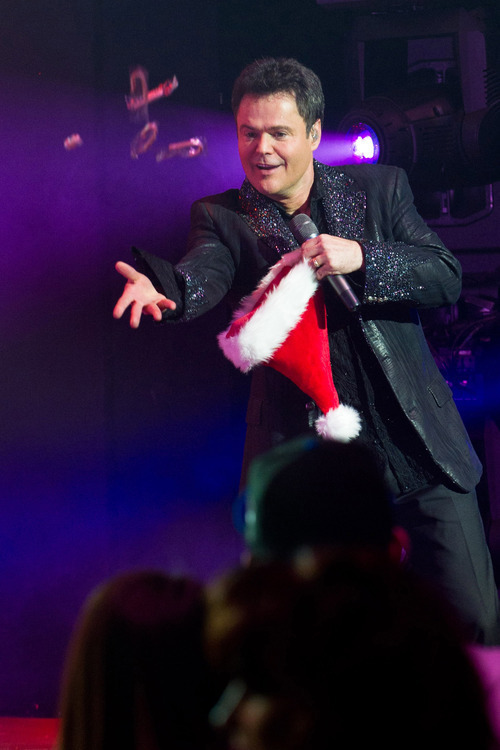 For the opening-night show, the Osmonds mixed seven Christmas numbers into their high-octane Las Vegas production (they'll return to the Flamingo Hotel stage in January). 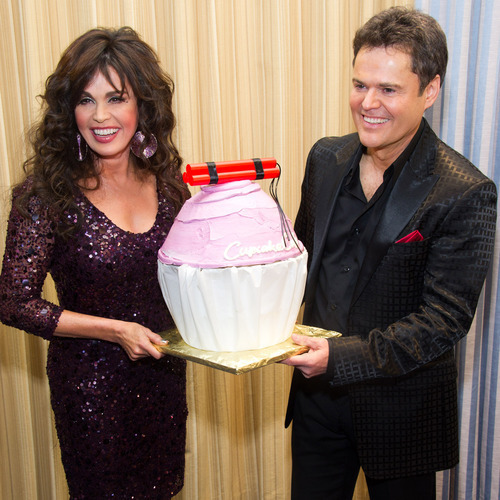 And since the run opened on Donny's 53rd birthday, after the closing curtain Marie continued ribbing her older brother by presenting him a dynamite-topped, purple-frosted giant cupcake. Early crowd reviews seemed uniformly positive. "It was first-class entertainment," said Frances Sanger, a London resident who came to the show while on a family visit to Connecticut. "They worked well together all the way through a rigorous presentation of almost their entire repertoire." In the lobby before and after the show, fans peered at two cut-out figures of the stars adorned with red Santa hats. "I came into it expecting it to be a little cheesy, and it was," said Antonia Barba, a 32-year-old social worker in New York City. "But I really respected the way they handled the crowd. It was like nothing I'd ever seen before." Speaking at a post-show press line-up, Marie admitted their show doesn't necessarily conform to the standard Broadway formula of contemporary musical theater. "We were raised in a different generation, taking our example from stars like Frank Sinatra and Sammy Davis, Jr.," Marie told The Tribune. "What you really have to do is entertain, not just be celebrities. You really have to try to break that fourth wall, and that's our challenge  to put 48 years of entertainment knowledge into one show." The entertainment world tends to send "seasoned" entertainers out to pasture just because they're seasoned, Donny Osmond said on Friday morning, sitting on his dressing-room couch. In contrast, he's looking forward to Todd Rundgren producing his new solo album. He still relishes the balance of a performer's life on stage with home life back in Utah. "I love the fact that I can just go home to Provo and be a neighbor, and see kids jump on my trampoline," he said. "I'll never forget meeting Elvis when I was 14. He was just a sweet, normal, humble guy. He taught me that you can be king of the world when you're on stage, but off stage you put your pants on one leg at a time, just like anyone else." Back before Thursday's opening curtain, a handful of women friends  most of them middle-aged, most from Long Island  talked about the longevity of the Osmonds' performing career. "The way they treat their fans is something that spreads between fans," said Cheryl Geller, 43, a stay-at-home mother. "The closing lines of their television show say it all: 'May God keep you in his tender care, until he brings us together again.' How can you beat that?" Through Dec. 30 at Broadway's Marquis Theatre, 211 West 45th Street, New York; tickets at http://www.ticketmaster.com.